In 2015 the Gulf Coast Ecosystem Restoration Council (Council) evaluated its first submissions for potential funding under the Council-Selected Restoration Component. Each State and federal member of the Council was responsible for proposing restoration projects and programs for consideration by the Council as a whole. The Council solicited formal public comment when the Draft Funded Priorities List (FPL) was published in August 2015. As part of the proposal evaluation process, each submission was evaluated with respect to Budget, Science, Environmental Compliance, and consistency with the RESTORE Act and the Council’s Initial Comprehensive Plan (referred to as “Priority and Commitment to Plan”). The Council prepared “Context Reports” summarizing the results of these evaluations. These reports may be downloaded by clicking the links below. The questions in all Context Reports were drawn directly from the Council’s Proposal Submission Guidelines. Please note that these Context Reports represent a snapshot of the status of a project as of August 2015. Council members were able to submit additional information to address any identified gaps. Accordingly, the Council’s assessment of each project may have evolved over time. Following are brief overviews of the four types of Context Reports. The Budget Context Reports provide a high-level assessment that the amount of funding reserved for any project/program selected for the Initial FPL is adequate for overall budgeting purposes. The Budget review does not replace the more in-depth budget/financial reporting review that is required before a federal grant or interagency agreement can be awarded. Upon a proposal being selected for funding, the proposing entity must comply with all budget and financial performance reporting required for federal grants and interagency agreements. The purpose of the Priority and Commitment to Plan evaluation is to review the proposals against the four Priority Criteria set forth in the RESTORE Act as well as the Goals, Objectives, and Commitments made by the Council in the Initial Comprehensive Plan. The purpose of the External Science Review is to ensure that proposals will be, per the RESTORE Act, conducted using the Best Available Science. A broad pool of expert volunteer reviewers was solicited from within the five Gulf States and from across the country. Each proposal was independently reviewed by three volunteer reviewers: one from the Gulf State most directly linked to the proposal; one from the Gulf of Mexico Region but not the most directly linked State; and one from outside of the Gulf of Mexico region. With 50 proposals, this yields 150 science reviews. 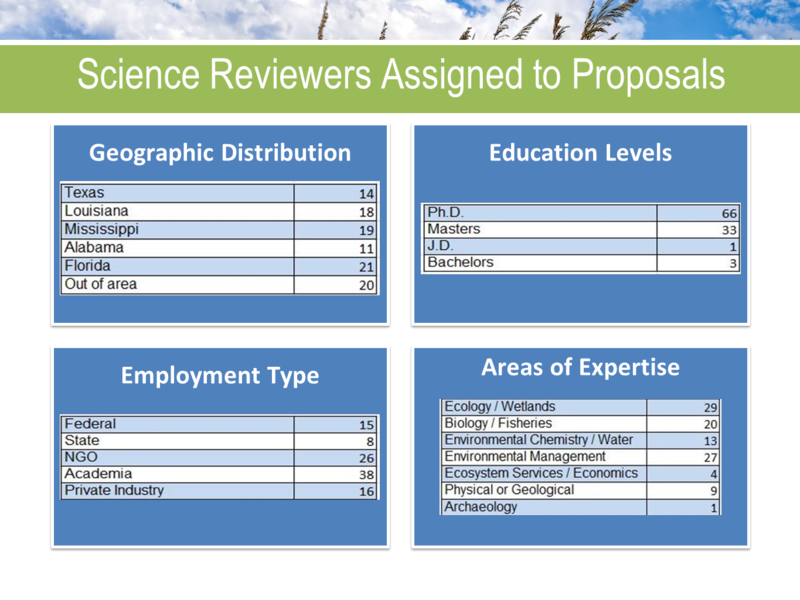 In accordance with established science review processes and in order to ensure that the Council received candid feedback, reviews were anonymous, though the overall qualifications of the reviewer pool are posted here (Graphic: Science Reviewers Assigned to Proposals). Reviewers were assigned proposals based on their areas of expertise and it was ensured that reviewers were not assigned proposals for which they had a conflict of interest. Reviewers were assigned 1-4 proposals each, with the majority of reviewers receiving one proposal. Reviewers assessed proposals with regard to the use of best available science and the science context of the proposal. While all reviewer names have been redacted, the science reviews are in their “raw” unedited form as provided by the individual reviewers. The Environmental Compliance Context Reports provide general information to help guide future environmental compliance activities where planning and/or technical assistance funding is being sought. In cases where implementation funding is being sought, the reports briefly summarize the environmental compliance status of the given project or program. Planning and/or Technical Assistance Submissions: For submissions in which planning and/or technical assistance funds were requested, the context reports identify some of the environmental laws which would apply if the project or program were to be implemented at some point in the future. If planning and/or technical assistance funds were awarded for such a submission, a portion of the monies could be used to address applicable environmental laws. In that case, the report would serve as initial guidance to help ensure all applicable laws are identified and addressed prior to submission of a request to fund implementation from the Council-Selected Restoration Component or some other potential source of funding. In such a situation, the report will also recommend early coordination with regulatory agencies to help ensure efficient compliance processes. Implementation Submissions: Prior to approving implementation funding for projects and programs which would have an effect on the environment, the Council must comply with the National Environmental Policy Act (NEPA) and other Federal environmental laws and requirements, where applicable. In cases where implementation funding is being requested, the context reports provide general overviews of the status of the submissions with respect to compliance with NEPA and other applicable environmental laws. A number of the projects and programs for which implementation funding was sought have, to varying degrees, been subject to review pursuant to NEPA and other environmental laws. In some cases, the NEPA analysis has been completed in the form of an Environmental Assessment (EA) or Environmental Impact Statement (EIS). Other submissions or components of submissions were covered by a NEPA Categorical Exclusion (CE). In a number of cases, activities proposed within submissions were also subject to review under the Endangered Species Act, Clean Water Act Section 404 and other environmental laws. The Council is fully aware of the public interest in achieving on-the-ground coastal restoration results as expeditiously as possible. The Council is also aware of the importance of selecting the most effective restoration projects and programs. When appropriate, the Council considered adopting existing NEPA documentation (EISs and EAs), in order to expedite the most effective projects and programs. To that end, the reports indicate where existing NEPA documents were available for the Council to consider adopting or where further action was needed with respect to compliance with NEPA. The reports also indicate where a CE might be applicable, as well as the status of compliance with other applicable laws. The context reports provide a brief summary of a submission’s environmental compliance status as of February 2015. The Council and individual members continued to address outstanding environmental compliance issues for submissions in which implementation funding was requested. The Council considered any new information regarding environmental compliance as it developed the Initial FPL. The Council’s draft FPL was published for public review and comment. For all proposed implementation funds in the draft, the Council provided information on environmental compliance for the given project or program. For activities where the Council proposed to adopt an EIS or EA, the NEPA document for that activity was available for public review. The Council published the Draft FPL on August 13, 2015. The Draft FPL was made available for formal public review and comment. After careful consideration of public input, the Council published the final Initial FPL. The Council anticipates that future amendments to the FPL will include significantly larger projects and project lists that reflect the full amount available to be spent for restoration activities. Additional input from the public will be solicited accordingly.